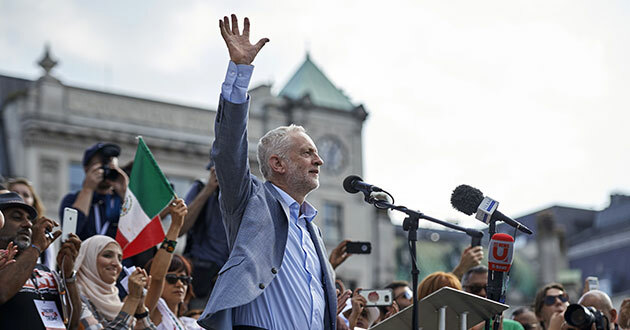 The prospect of a British government headed up by Labour leader Jeremy Corbyn – a veteran internationalist – should be a source of hope. But how would his government break from the past when the global economy is hardwired to extract profit from the Global South? Barnaby Raine proposes four ideas to help square the circle. In another world, when the spectre of global revolution loomed, a brilliant Bolshevik leader produced two under-appreciated classics. Nikolai Bukharin’s Imperialism and World Economy, written in 1915, and The Economics of the Transition Period, penned five years later, both begin by making the case for a single principle: if there is such a thing as ‘the economy’, it is a global thing. All ‘national economies’ are entangled in processes that span borders. In the early years of the 20th century, such transnational thinking was important to the Left flank of European socialism. Rosa Luxemburg criticized Marx for his failure to practise it sufficiently. This was a world of empires, where transnational links were the norm. Those links were blood-soaked, born of domineering violence, but, in that interconnected world, revolutionaries could envision common fights against common enemies from Dundee to Delhi, replacing empires with a new world order. It was a vision of the future now consigned to the past. In the event, empires gave way instead to a world of nation-states. Today we all tend to think in little bordered boxes, talking freely of the, say, ‘British economy’ against the better advice of Bukharin and Luxemburg. Politics has been transformed too, since people usually think of it taking place within nations rather than being enacted by global movements. Electoral politics has a structural tendency towards nationalism – to win, parties have to persuade voters in one nation that they will represent their interests – and so a tension arises for those whose constituency ought to be the exploited and oppressed of the whole world. This tension is present in thinking about economic policy: should the job of a Left government be to save British jobs, even at the cost of jobs in Africa or Asia or South America? Should British companies be defended when they rely on colonial privilege? Given that the structure of the world economy – inherited from colonialism – ensures value is sucked from the Global South to benefit Europe, this is a pressing problem of dual loyalties. Take De La Rue, a British printing company. Trade unions and the Labour Party joined in the furore when De La Rue lost the contract for making British passports to a Franco-Dutch rival last year; Jeremy Corbyn’s call to ‘Build it in Britain’ seemed pitted against government decisions like that one. Established in the 19th century, De La Rue built a global business at the hip of the British Empire, printing money for colonies and semi-colonies. After the Anglo-American invasion of Iraq in 2003, the company celebrated a big windfall as it was handed a vast contract to print money for the new government there: transferring millions from Baghdad to Britain at the barrel of a gun. This is the economics of contemporary imperialism at its crudest. And this is a company that Labour found itself championing – understandably, given the fear that their loss of a contract would put jobs at risk in Britain. Should the job of a Left government be to save British jobs, even at the cost of jobs in Africa or Asia or South America? Here, then, is the challenge. Labour Shadow Chancellor John McDonnell’s economic policy is centrally concerned with evening out geographical inequalities, but he has concentrated mostly on inequalities within the nation. Prominent Corbyn-supporting analyst Paul Mason talks of a ‘programme to deliver growth and prosperity in Wigan, Newport and Kirkcaldy – if necessary, at the price of not delivering them to Shenzhen, Bombay and Dubai’. Such thinking is not only the traitorous choice of a wealthy nation, it reflects difficult realities. In Britain, Thatcher’s victories over the working class are narrated in narrow, national terms, but neoliberalism also marked the vanquishing of the Global South’s attempt to put an end to imperial economic hierarchies and create a fairer system. Now, instead of India at the helm of the Non-Aligned Movement, the grouping of countries that charted a way between the USSR and US and pushed for more egalitarian relations between nations, we have India run by Prime Minister Narendra Modi. These changes complicate the meaning of internationalism and solidarity from Europe. The community of global revolution seems lost. There are a few things a Corbyn government could do straight away in these tough conditions. Importantly, none of these proposals give ground to the miserable zero-sum game in which the only way to benefit British workers is through extracting economic value from the Global South. The first step would be to use economic levers to reorient Britain in the world by announcing sanctions on the worst former allies. This entry was posted on Wednesday, April 10th, 2019 at 00:05	and is filed under Uncategorized. You can follow any responses to this entry through the RSS 2.0 feed. Both comments and pings are currently closed.